Description 2005 Softail Deluxe, Vivid Black, smoke tinted (tall) windshield, 1" chrome highway bars, color-matched hard saddlebags, remote controlled red-LED under lighting, clutch-ease package installed, back rest installed, front control leather streamers, custom exhaust package installed, 1 woman's XS helmet, 3 bungie cords and 1 bungie net in right bag along with my summer-full-finger gloves. Approximately 11,850 miles at time of theft. I have the remote control for the LED lights. I have the only key to this bike. 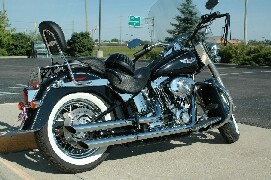 Photo taken before saddlebags were installed. 08-09 Indiana Plate "RZBLSM"